How a cafeteria owner took on the underworld and brought down a mayor. 1931 was not a good year to be a restaurant owner, either, let alone one where payment was optional. The U.S. was is the middle of the worst economic crisis in its history. The stock market had collapsed. Banks closed, taking depositors’ savings down with them. Unemployment was high, consumer confidence low. Major industries, like the Big Four automakers and the motion picture studios, were on shaky financial ground. Los Angeles had so far avoided the worst of the Depression but was now feeling its effects. In July Clinton leased a two-story building at 618 S. Olive St. near Pershing Square Park, designed ten years earlier by architect Charles F. Plummer, one of several outlets for the successful Boos Brothers chain. Now the place was bleeding money and the owners jumped at Clinton’s offer to take it off their hands. 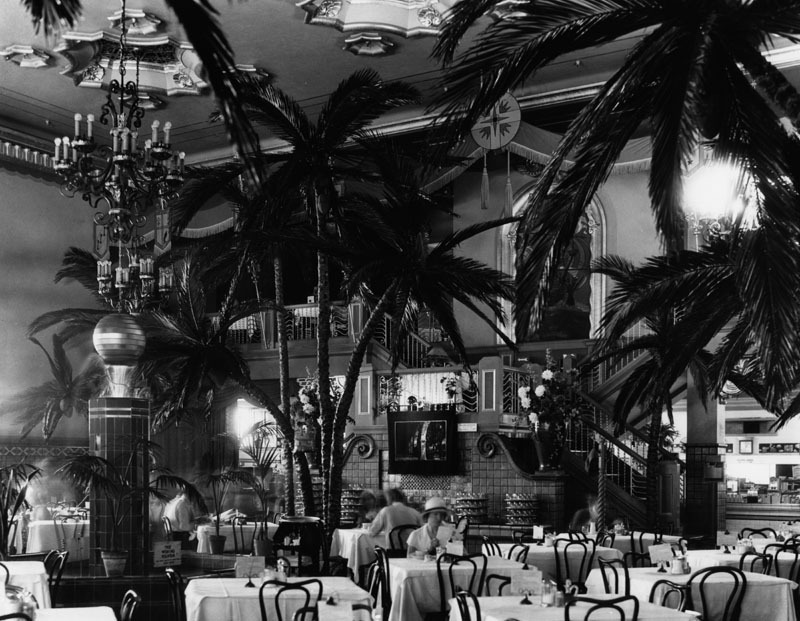 On September 17, 1931, Clifton’s “Cafeteria of the Tropics” had its grand opening. 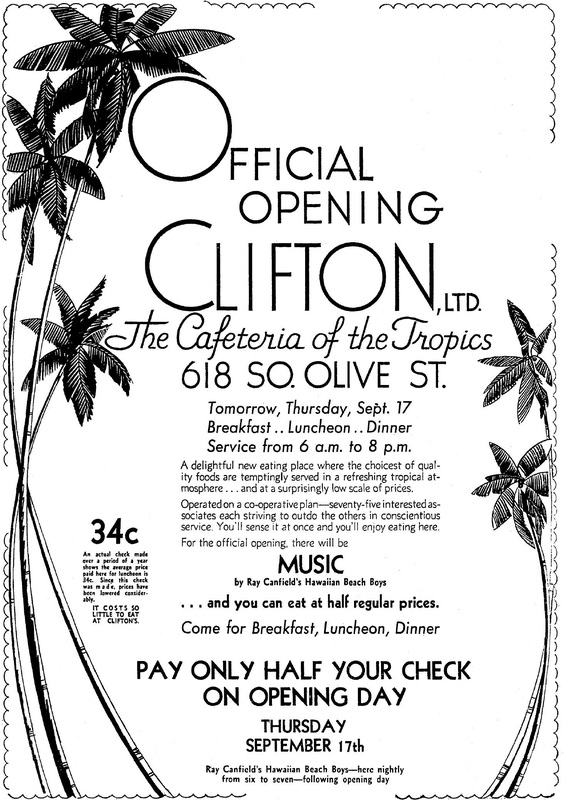 Ad for the grand opening of Clifton’s Cafeteria of the Tropics, 618 S. Olive St., September 17, 1931. “A tray-ful for a tri-ful” Some 84 employees had a share in the business through a profit-sharing plan, unusual for the time. 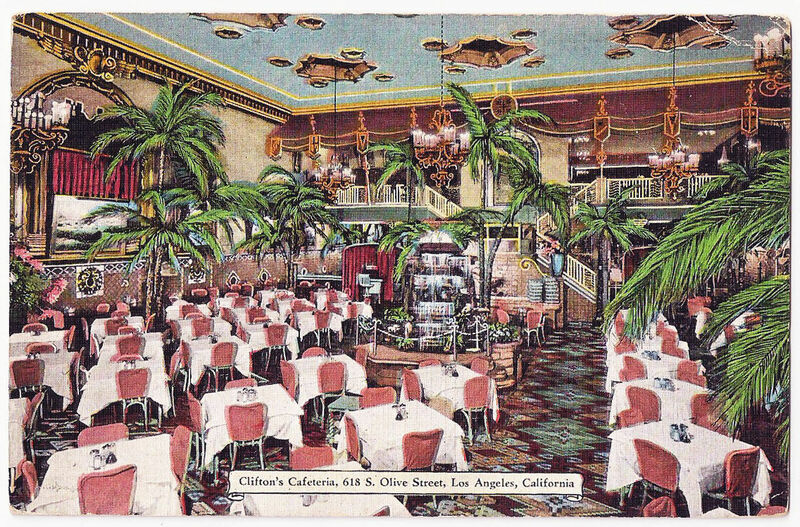 Postcard view of Clifton’s Cafeteria dining room at 618 S. Olive St., postmarked 1931. To everyone’s surprise (except Clinton’s), the venture was a success. By September 1935 he was able to open a second restaurant at 648 S. Broadway, another former Boos Brothers. 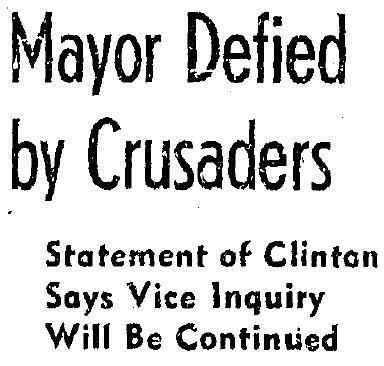 It was around this time that Clinton first came to the attention of the Los Angeles underworld. 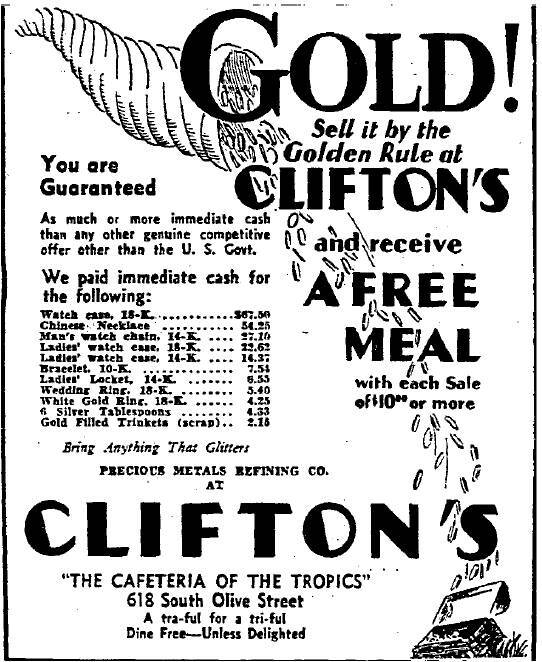 “Bring Anything That Glitters.” Clifton’s not only operated by the Golden Rule, in 1934 it was buying gold, a reflection of the Gold Reserve Act signed into law in January. County Supervisor John Anson Ford had asked Clinton to head a committee of three restaurant owners to look into the food situation at the County General Hospital, the new (and expensive) facility that had opened in April 1934 after years of construction. 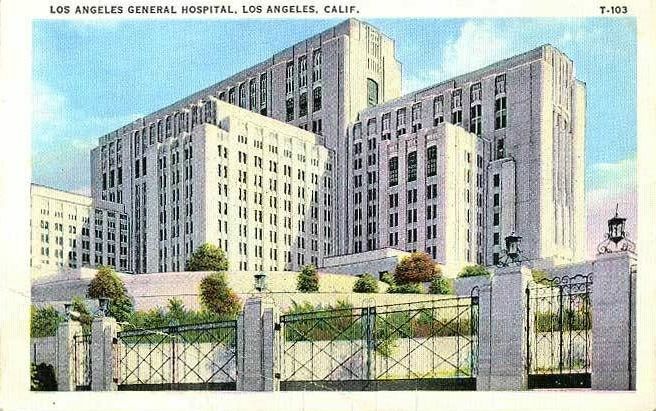 Postcard view of County General Hospital, 1935, nicknamed the “Supervisor’s Folly” during its years of construction. Among those supervisors was one Frank Shaw. Clinton took the task seriously and indeed found considerable waste as well as graft at County General, which he documented in a report to Ford. 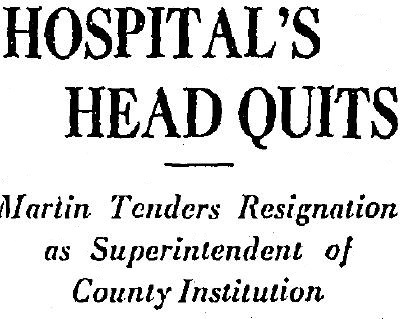 The hospital supervisor tendered his resignation in June 1936, citing health reasons. If the “big boys” thought they would intimidate Clinton, they were wrong. Despite a mild-mannered, bespectacled appearance, he was a WWI vet who had seen action in France in the Tank Corps, and didn’t scare easily. 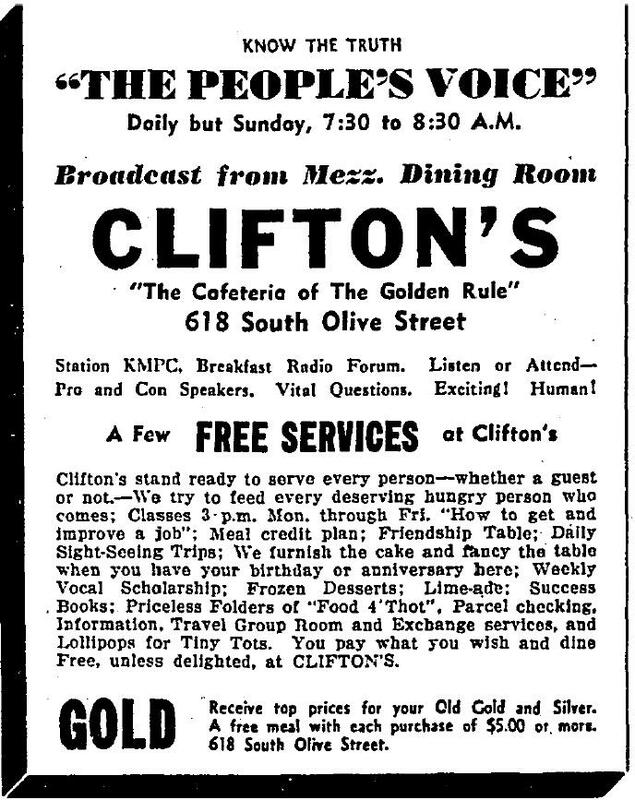 He took a greater interest in civic affairs, initiating a morning radio show, “The People’s Voice” over station KMPC from 618 S. Olive’s mezzanine dining room. His efforts didn’t go unnoticed by Superior Judge Fletcher Bowron, who along with Ford nominated Clinton to the 1937 County Grand Jury. As he listened to the many complaints to the jury about vice and gambling around Los Angeles, it occurred to Clinton that such widespread operations couldn’t be happening without the knowledge, and likely the consent, of city and county officials. He sought Judge Aggler, adviser to the grand jury, and told him that he wanted to conduct an investigation into vice conditions. Aggler encouraged the effort but warned that it wouldn’t be easy, nodding pointedly out the window at City Hall from his chambers in the Hall of Justice. 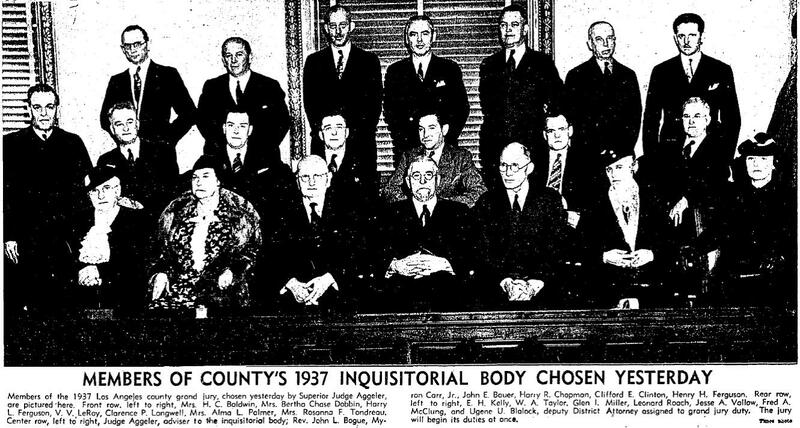 The 1937 Grand Jury. 2/14/37. Clifford Clinton seated in center row 6th from left, with striped tie. There had been reform efforts before, of course. In the late 1920s City Councilman Carl Jacobson had gone after the city’s top bootlegger, Albert Marco, and gambler Farmer Page; both were allied with Charles Crawford and had and had connections to City Hall through Kent Parrot, a fixer who many believed was the real power behind then-Mayor Cryer’s administration. In 1929 Crawford and others, including high ranking police detective Harry Raymond, had been charged with conspiracy to frame Jacobson in a morals case. Crawford was acquitted due to lack of evidence, but Raymond had had to resign and the Chief of Police, Jim Davis, had been demoted partly as a result of the debacle. 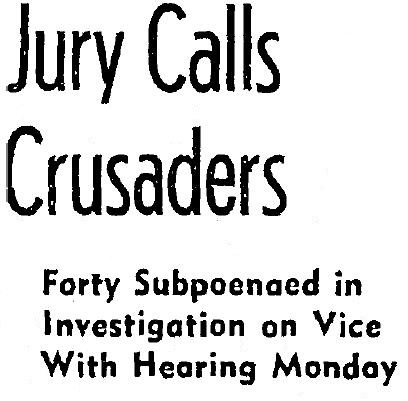 The 1934 grand jury had attempted to conduct an investigation into vice conditions, graft and corruption much like the one Clinton proposed in 1937. Foreman Dr. John F. Buckley stated “We expect to get at the root of all gambling in the city and county,” widening the scope to include D.A. Buron Fitts. D.A. Buron Fitts (front row, left) seated next to Sheriff Eugene Biscailuz and Chief of Police James Davis at a “gambling conference” in April 1937 with (standing L-R) Newt Kendall, City Prosecutors office, Chief DDA William Simpson and U.S. AG Webb. LAPL. Fitts had been appointed D.A. in late 1928, having successfully prosecuted his predecessor Asa Keyes for bribery related to the Julian Oil case. The jury subpoenaed local “gambling czars,” Page, Scherer and McAfee, as well as Kent Parrott and others, but the witnesses stonewalled or refused to testify. The investigation had gotten nowhere by the time the 1934 grand jury disbanded. In March 1937, the “Citizens’ Committee of 1000,” led by Rev. A.M. Wilkinson, formed to combat corruption in public office, urged the 1937 grand jury’s criminal complaints committee to investigate members the State Board of Equalization, then in charge of issuing liquor licenses. Nothing happened. 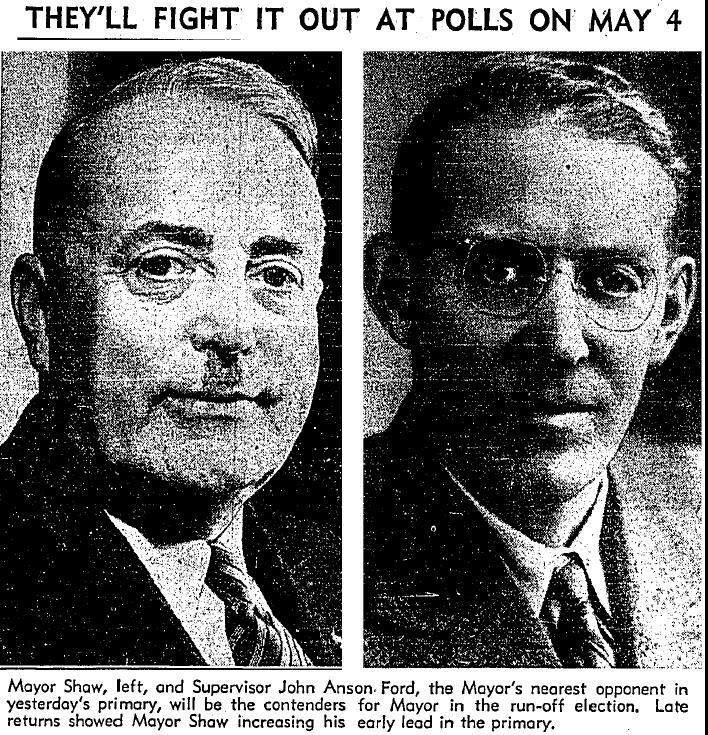 Supervisor Ford, with Clinton’s backing, ran against Shaw for mayor in 1937, promising to “clean up City Hall,” which, Ford said, “reeks with corruption and vice.” But, on May 4, Shaw won a second term. On July 12, 1937, the United Church Women sought the newly-reelected mayor’s cooperation in investigating a list of 110 suspect gambling or vice resorts obtained by University Methodist Church pastor Rev. Wendell L. Miller through a likewise independent investigation. Shaw placed the list into the hands of his Chief of Police, Jim Davis, whom Shaw had restored to power in 1933. A few nights later, on July 19, gambler George “Les” Bruneman was shot by unknown assassins near his Redondo Beach club. Though critically wounded, Bruneman survived. That same evening, in another part of the city, a group of citizens led by Rev. Miller, met and passed a resolution to ask the grand jury to form a separate committee to investigate vice conditions. 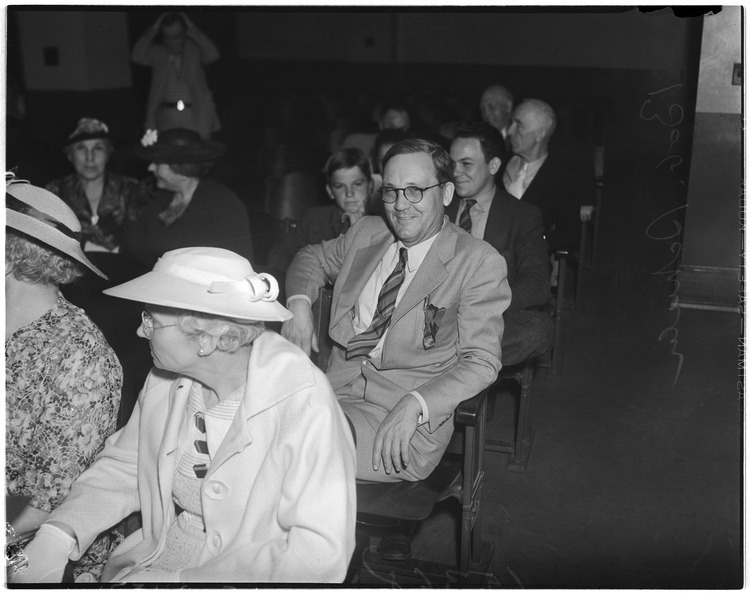 Clifford Clinton attended, along with Dr. Buckley, Rev. Wilkinson, and Trinity Methodist Church pastor Rev. Robert “Fighting Bob” Shuler. Evangelist Rev. Robert Shuler c. 1935. UCLA. In the late ’20s, Schuler had been a vocal critic of City Hall and Chief Davis. From his popular radio pulpit, he’d advocated recalling D.A. Keyes (who lost his office after being convicted of bribery) and Mayor Cryer (who decided not to seek reelection in 1929), and rallied support for Carl Jacobson. His church had been bombed in January 1928, and his radio license yanked in 1931, but these actions hadn’t stopped him speaking out. Citizen-led vice investigation organizations were not unknown elsewhere in the US. Chicago had had the Secret Six, formed in 1930 to help fund the effort to bring down Al Capone and combat gangland activities. 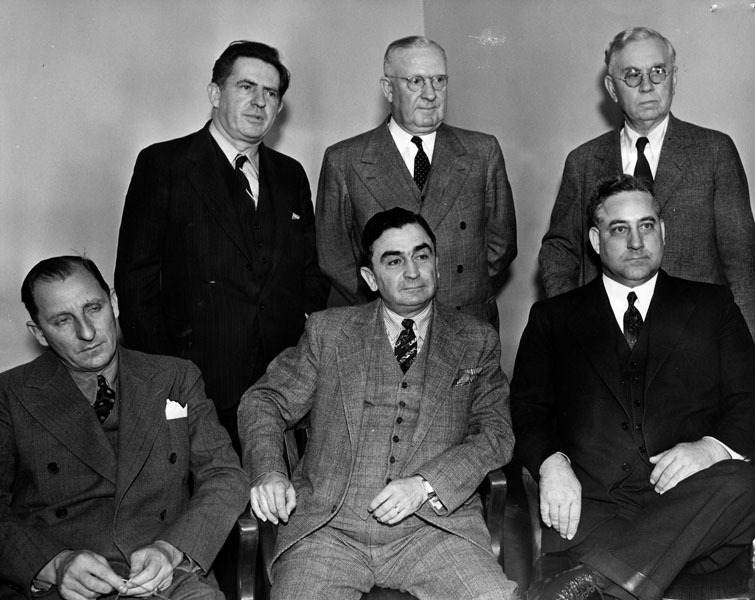 New York had the Citizens Committee on the Control of Crime, founded in 1936 and headed by philanthropist Harry F. Guggenheim. 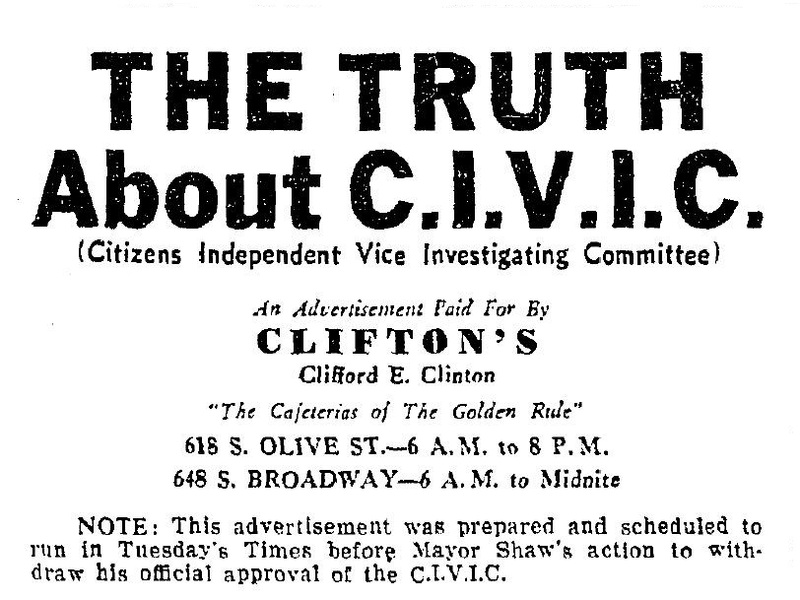 The Los Angeles group decided to call itself the Citizens Independent Vice Investigating Committee (CIVIC), to be led by Clinton Clifford and headquartered at 618 S. Olive St. Hindsight would show Shaw’s bluster to be purely deflective and self-serving. In fact, since 1935 the LAPD had maintained a covert “intelligence bureau,” aka the “spy squad,” paid for out of the mayor’s “secret service fund.” Ostensibly the unit, headed by Det. Lt. Earle Kynette, worked for Chief Davis but reported directly to Joe Shaw. CIVIC, caught off guard by Shaw’s about-face, quickly rallied and vowed to carry on. Clinton noted that that the number of calls and letters from concerned citizens had doubled since the mayor’s withdrawal. Hitting back at the Mayor’s charge of “secret meetings,” CIVIC advertised mass meeting at Rev. Shuler’s tent revival headquarters, 65th & Normandie on August 22, 1937. Someone tried to sabotage the event by distributing at least 300 fake tickets promising attendees a “free chicken dinner and all the beer you can drink.” “We’re getting plenty of evidence without having to give chicken dinners for it,” Clinton responded. With Clinton paying the expenses out of his own pocket, CIVIC volunteers canvassed the city, gathering evidence and following up on leads provided by tipsters and underworld informants. Clinton verified many of these personally, confirming his original suspicion that a system of protected vice, gambling and prostitution existed within the city and county. Carl Jacobson had referred to this influential band of gamblers and vice purveyors as the “invisible hand.” Clinton called it “the combination.” Eventually CIVIC amassed evidence of some 1,800 bookmakers, 200 gambling dens, and 600 brothels, all granted immunity by payoffs. Meanwhile, the grand jury had promised to “get answers” on the Bruneman shooting. 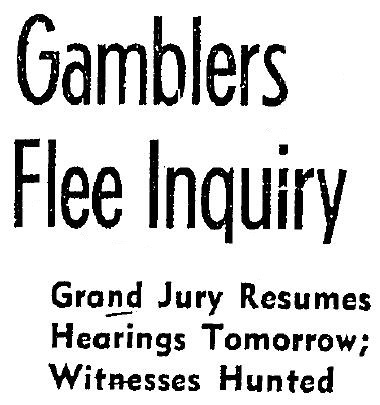 Subpoenas were issued to the city’s “high gambling chiefs” in early August but the witnesses- usual suspects McAfee, Scherer, Page, Jack Dragna, Johnny Roselli, Eddie Nealis, Chuck Addison and others- scattered to the winds. The grand jury did find another matter it deemed worthy of investigation, however: some of these same high gambling chiefs accused CIVIC vice crusaders of being shakedown artists. 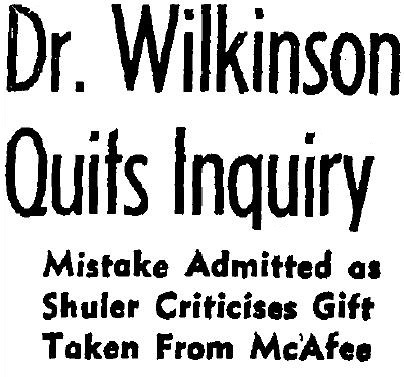 On September 8, Dr. Wilkinson was asked to tell the jury about a $4400 check he’d accepted from Guy McAfee back in June 1936 (more than a year before CIVIC was formed). Wilkinson said the money had been a donation for a pageant known as “The Last Days of Pompeii.” He admitted that in retrospect it had been a mistake to accept the money, but insisted it came with no strings attached. With the Shaw-friendly Times making the most of the trumped-up “scandal,” Wilkinson submitted his resignation to CIVIC, but the committee refused to accept it. At the same time, a flim-flam organization known as the “Municipal Development League” wrote a letter to the grand jury, notifying them that Clinton had a record for theft back in San Francisco. It had been a minor incident, years back, involving some old marine parts salvaged off an abandoned boat. Clinton sued the group for slander. If these attempts were part of an effort to discredit CIVIC’s representatives in advance of its findings going public, they may also have intended to serve as a smokescreen for an even more worrisome problem for McAfee and Shaw. In early September, Clifford Clinton’s lawyer, A. Brigham Rose, was working on a bankruptcy case involving former police commissioner Harry Munson. 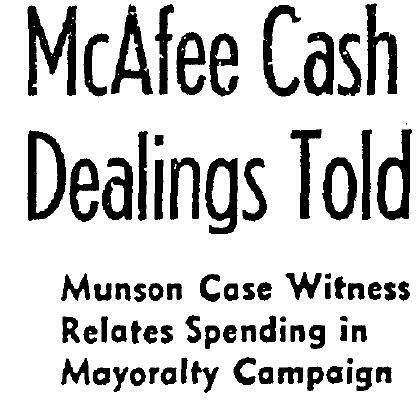 An ex-employee of Munson’s testified that Munson had worked for Guy McAfee during Shaw’s 1933 mayoral campaign, and that McAfee funneled fistfuls of money to Shaw through Munson. Shaw had subsequently appointed Munson to the police Commission. Rose, who represented the creditors in the case, hinted that there would be further “interesting testimony” to come when the trial continued in October. Shaw was likely well aware, thanks to his spy squad, that Rose had hired Harry Raymond, now working as a P.I., to dig up evidence on Munson. 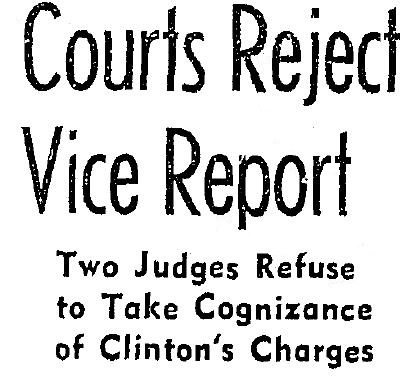 Meanwhile, by mid-September 1937, Clinton was ready to have the grand jury listen to CIVIC’s evidence on vice and crime. The majority faction of the jury, however, refused to hear it unless Clinton revealed his witnesses in advance. Clinton, having lost a key ally when Judge Aggler passed away suddenly in July, balked, saying he would take it up with Presiding Judge Bowron. A few days later Clinton told confidants about the collusion he’d uncovered between the mayor’s office and underworld figures like McAfee. Unbeknownst to Clinton, Joe Shaw was able to hear his every word. The spy squad had placed a hidden Dictaphone in Clinton’s home. On October 24, there was a second attempt on the life of Les Bruneman. This time it was successful. A few days later, on October 29, Clinton was ordered by the grand jury to present CIVIC’s findings. That night, in the wee hours, a bomb exploded in Clinton’s home. Fortunately no one was injured. A disgruntled employee implied that Clinton may have set the bomb himself as a publicity stunt, a baseless suggestion the Times readily repeated. A witness would later be found who saw a green sedan speeding away from Clinton’s street that night; the vehicle’s description matched one used by the spy squad. At the time, however, the police did not appear very interested in getting to the bottom of it. 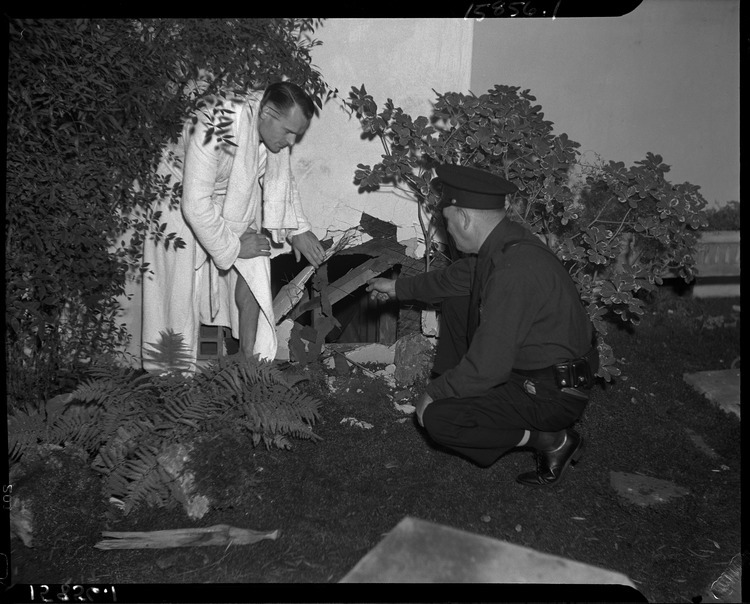 Clinton examining the bomb damage, October 1937. UCLA. Another revelation was that the 1937 grand jury was controlled 12 to 7 by the combination. Superior Court Judge Frike who oversaw the grand jury, refused to accept the document on the grounds that a “minority report” of the jury had not been recognized before. Judge Bowron accepted it into the official record, however. On December 29 Clinton’s vice inquiry was declared closed when a representative of D.A. Fitts’ office proclaimed that it “failed to marshal enough facts” to warrant further investigation. Until the night of January 14, 1938. That was when Harry Raymond stepped on the gas of his car and set off a bomb under the hood. Raymond survived, somehow. Clinton and Brigham Rose rushed to his bedside. Rose clarified that Raymond had been doing some investigating for him on the Munson case, and in fact was due in court to testify. Despite the efforts of Chief Davis to effect a cover up, the bomb was soon traced right back to the LAPD, specifically Earle Kynette and the “spy squad.” Kynette was indicted on January 26. 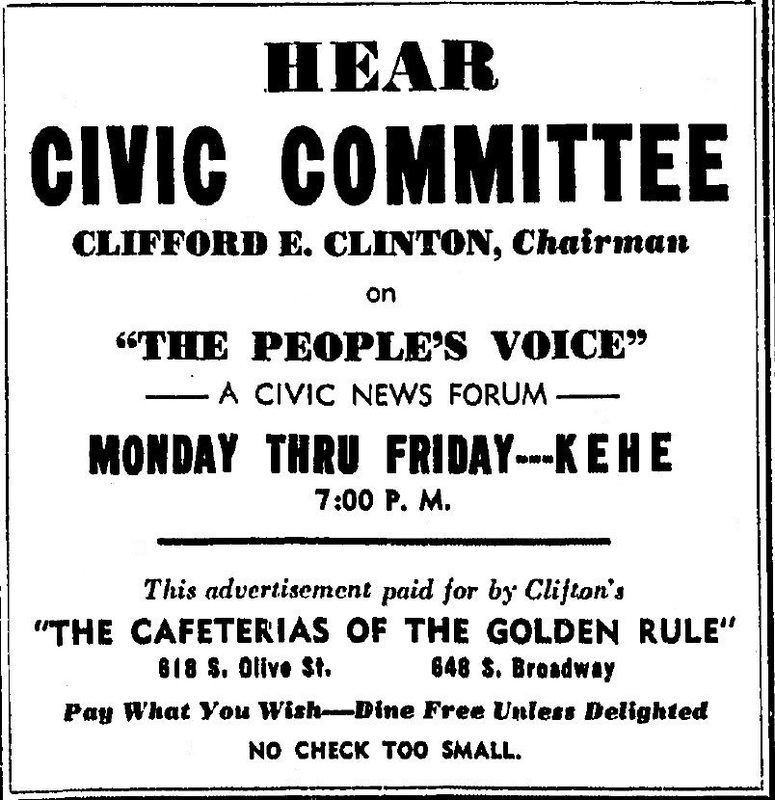 Ad for Clinton’s “The People’s Voice” on KEHE February 1, 1938. Kynette’s trial began on April 12. Information about the spy squad’s surveillance of Raymond came out, but it was also shown that they had kept tabs on Clinton, Supervisor Ford, and some 300 other Los Angeles citizens deemed political “enemies” or otherwise unfriendly to the administration. 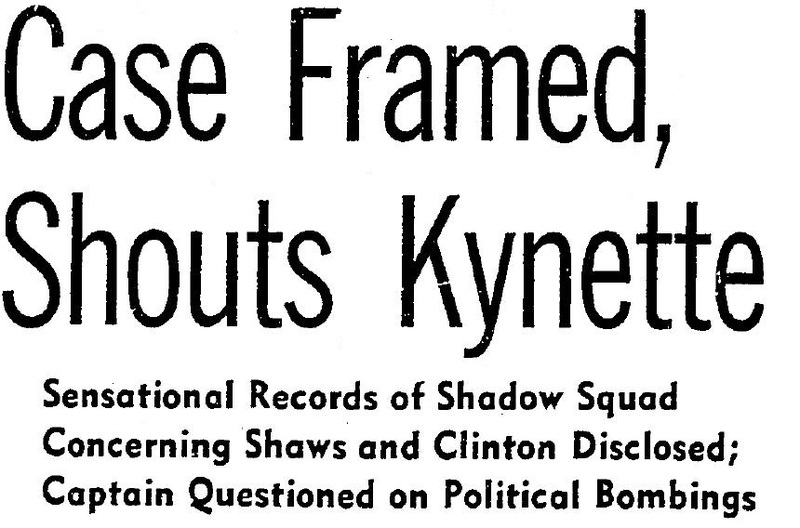 After denying that the spy squad had ever overheard any of Clinton’s private conversations or installed a Dictaphone anywhere where such conversations might be recorded, Kynette screamed “frame up!” when a transcript of a recorded conversation between Clinton and his confidants dated October 3, 1937 was read in court, made from Dictaphone records found in his office. On June 16, Kynette and one of his assistants were convicted. 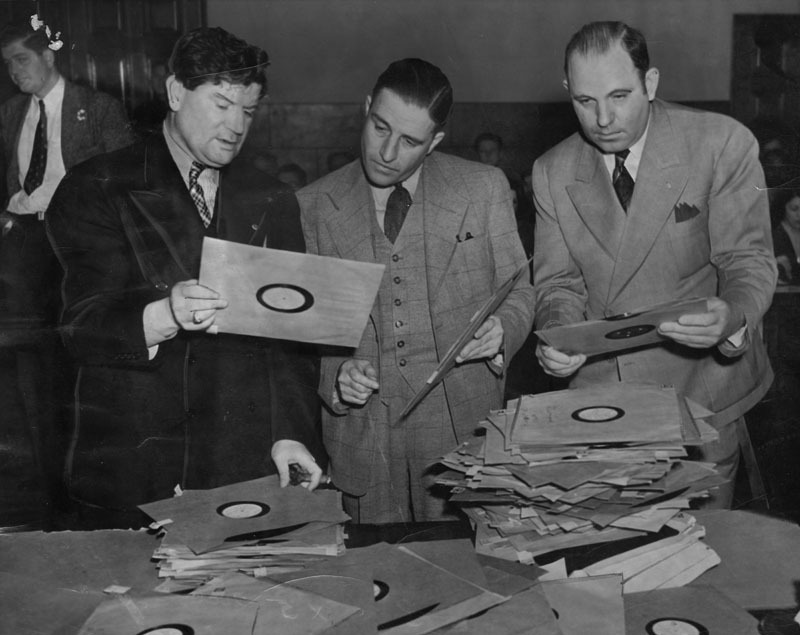 Attorney Joe Fainer (left) with some of the recordings made by the “spy squad.” LAPL. Though the L.A. City Council demanded the resignations of Davis and Shaw, nothing happened. Clinton proceeded with the recall effort and by July 14 had gathered enough signatures to file the petition. Judge Bowron was encouraged to run against Shaw in a special election held September 16. Running on a reform platform, he won easily and set about cleaning up City Hall and the police department. 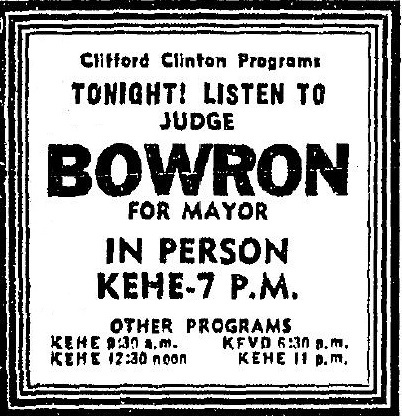 Mayoral candidate Judge Fletcher Bowron speaks on KEHE 8/19/38. 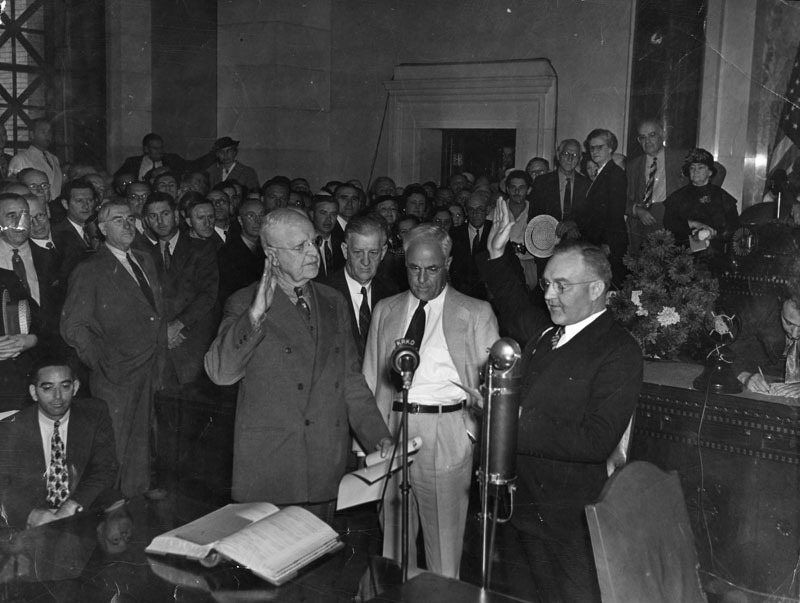 Mayor Bowron taking the oath of office, 1938. LAPL. Chief Davis was allowed to “retire” from the force, which he did on November 16, 1938. In January 1939, Clinton and Mayor Bowron (allegedly having also had help from ex-bootlegger Tony Cornero), quietly brought in Wallace N. Jamie, son of Chicago’s Secret Six prosecutor Alexander Jamie, as an undercover investigator to help weed out bad apples. On April 18, 1939 the police department was “purged” of 23 high ranking officers suspected of being on the combination’s payroll. By the summer of 1939 the gamblers had reportedly left town, but whether it was due to Bowron’s reforms or, as D.A. 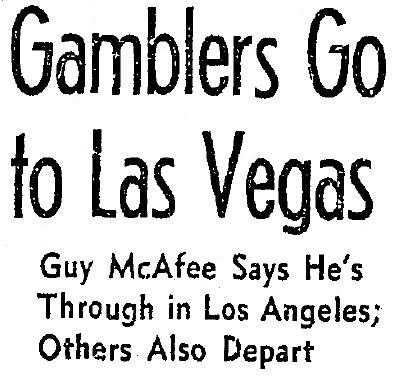 Fitts hinted, they were being squeezed out by a new figure “recently arrived from the east” who was said to be muscling in on the Los Angeles gambling rackets. They didn’t go quietly, in any case. There were repeated attempts to discredit Clinton, with detractors alleging that Clinton was backed by Detroit’s Purple Gang and had gambling interests himself. The underworld placed a mole within Mayor Bowron’s office in a further plot to discredit him. Neither Mayor Shaw nor any of the high ranking gambler faction faced any criminal inquiry as a result of the CIVIC investigation. Joe Shaw was found guilty in March 1939 on 63 counts of selling civil service examinations and promotions, but through the efforts of his lawyer, Morris Lavine, won a retrial that ended in the case being dismissed in 1941. First of Liberty’s 6-part “Lid Off Los Angeles” series, November 11, 1939. Clinton’s wife Nelda also gave her perspective in a three-part series “My Husband’s Death Struggle with the Vice Czars of Los Angeles” for True Story magazine’s December 1939-February 1940 issues. D.A. 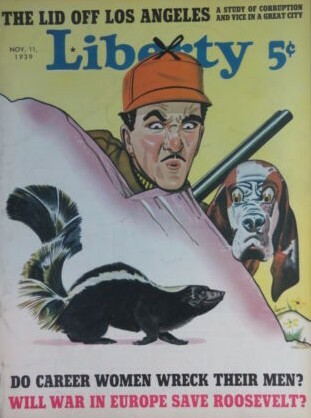 Buron Fitts offered a rather weak rebuttal to the “Lid Off Los Angeles” story in Liberty’s March 11, 1940 issue. In November 1940, a year after the story first appeared Frank Shaw sued the “Lid off Los Angeles” authors Dwight F. McKinney and Fred Allhoff for libel along with MacFadden Publications, Bernarr MacFadden himself, editor Fulton Oursler and several “John Does.” McKinney acknowledged that his primary source had been Clinton, who was called as a witness and spent several days on the stand. The jury, however, was unable to agree one way or the other, in March 1941. Shaw promptly filed a new suit, including Clinton this time, as well as a separate suit against Mayor Bowron, Mrs. Clinton and True Story magazine (also a MacFadden publication). McKinney’s house was damaged in an arson fire in September 1941, two days before the second Shaw trial began. 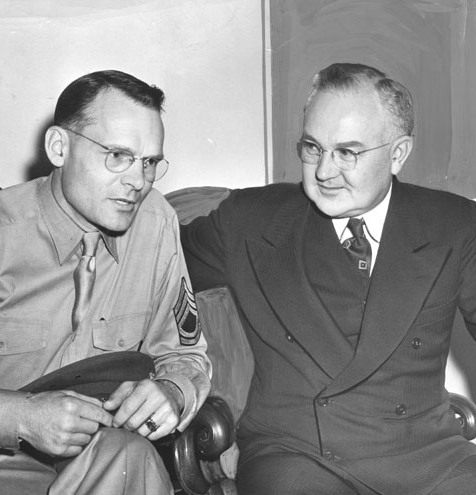 Clinton (in uniform) and Bowron, June 1942. LAPL. 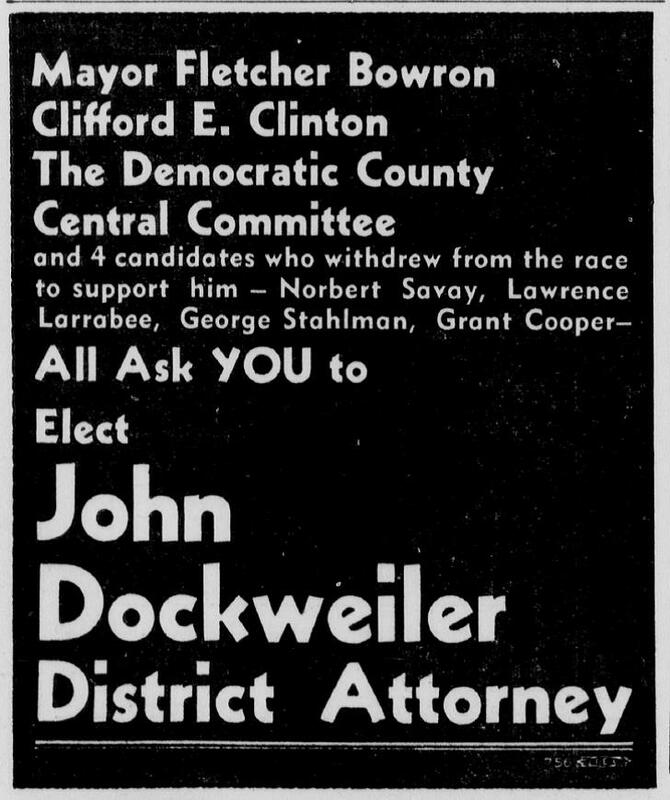 Clinton and Bowron had a falling out in 1943, and Clinton subsequently ran unsuccessfully against Bowron for mayor in 1945. The two had set aside their differences, publicly at least, by the time of Bowron’s third reelection campaign in 1949, and Clinton supported the mayor during a failed recall effort in 1950, engineered by some of Bowron’s old enemies and the latest iteration of the combination. Tom image: Clifford Clinton. LAPL. 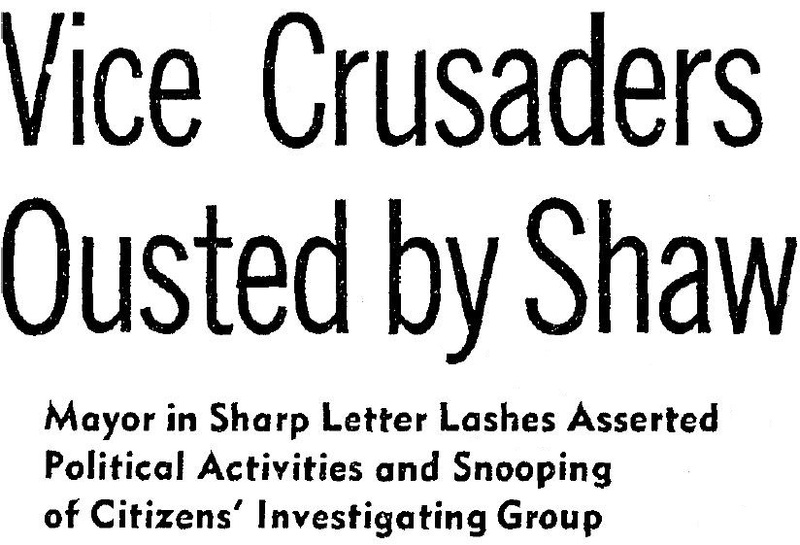 According to a 1938 ACLU lawsuit, the “spy squad” cost taxpayers $243,300 from 1935 to early 1938. It is sometimes reported that Raymond had been working for CIVIC; at the time, however, Rose clarified that Raymond had worked for him on the Munson case, though it’s possible that there was overlap. The name of Bob Gans, the “slot machine king” also factored in to the Munson investigation. A rumor that Raymond was shaking down his former coworkers seems to have originated with a subordinate member of the spy squad, who testified that he’d heard it from Kynette. Davis initially placed Kynette in charge of the Raymond bombing investigation. After his retirement, Police Chief Davis went on to work as head of security for Douglas Aircraft in Santa Monica starting in May 1939. He retired from that job in July 1944 citing ill health, and passed away of a stroke in June 1949. 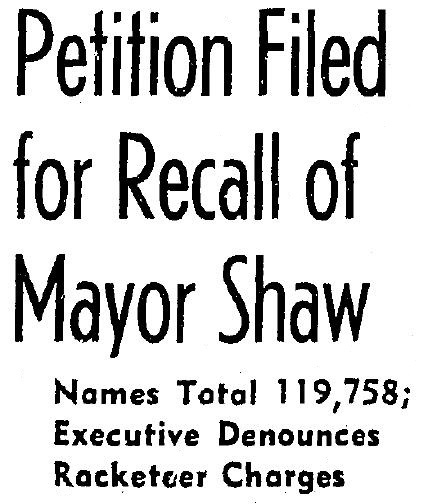 In the midst of his 1941 libel lawsuit, Frank Shaw had the gall to throw his hat in the ring for mayor but didn’t make the primary. He stayed out of the public eye once the Liberty case was settled, quietly operating a real estate business. He died in January 1958. Joe Shaw was found guilty on March 23, 1939 on 63 counts of altering public records and sentenced to 5 to 70 years. He appealed and won a new trial, a decision upheld by the state Supreme Court in April 1941 on the basis that the State had not provided evidence to corroborate the testimony of an accomplice (the same technicality that freed Bugsy from a murder charge in the Big Greenie case) and the case was ultimately quashed on June 11, 1941. 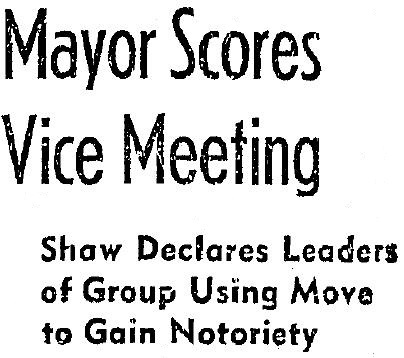 Shaw stayed out of the public eye until 1949, when he made a bid for mayor against Bowron and his name figured into another scandal involving the LAPD and Dictaphone recordings. He died in July 1965. Morris Lavine, Shaw’s lawyer in the case, had been disbarred in 1932 after his own conviction for extorting $75,000 from Charles Crawford in relation to the Julian Oil case. Harry Raymond underwent at least 15 operations to remove more than 150 pieces of metal from his body after the bombing. He died in April 1957, age 76. Earle Kynette was paroled in January 1948, over the objection of Harry Raymond. He returned to prison after incurring a drunk driving arrest in December 1950 and was released again on April 24, 1952, one of the conditions of his parole being that he could not return to Los Angeles. He reportedly worked as a pharmacist in Northern California. In July 1955 he was acquitted in another DUI case in which two people were killed. He died in June 1970, in West Hollywood. 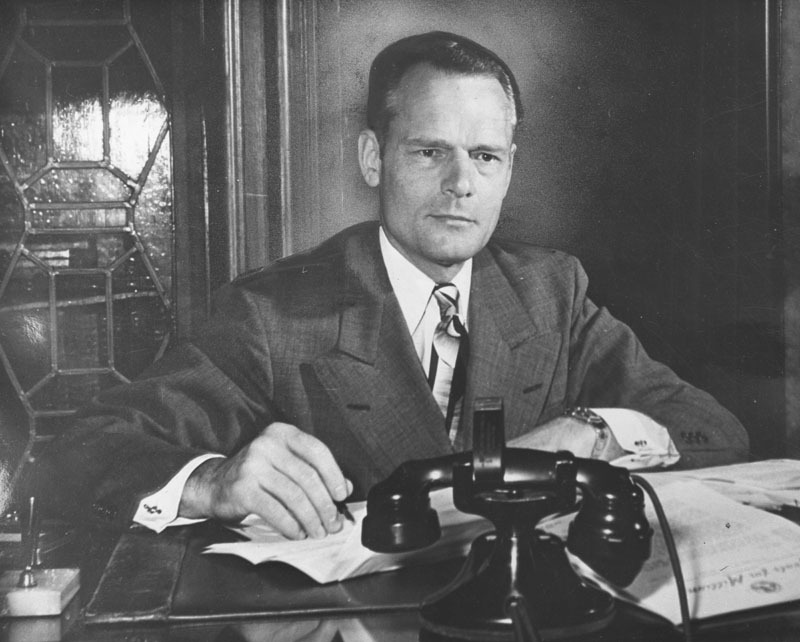 John Dockweiler took office in the middle of Bugsy Siegel’s murder trial in the “Big Greenie” case, but ultimately dismissed the charges. He reopened the Les Bruneman case in February 1941, citing “new clues” and hinting that Pete Pianezzi, who was convicted of the crime in 1940, had “taken the rap” for someone else but was “ready to sing.” It didn’t go anywhere, but Pianezzi was cleared and fully pardoned many years after the fact. 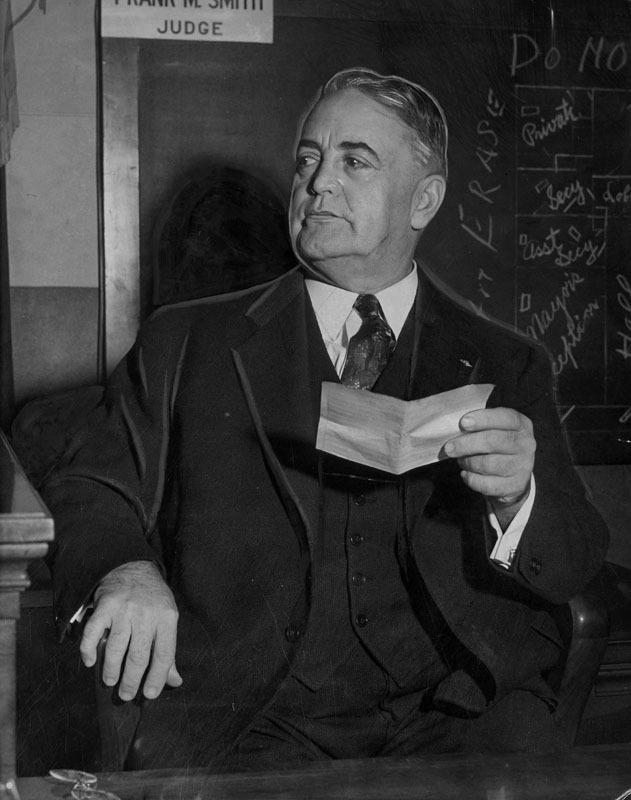 Dockweiler died suddenly of pneumonia in January 1943 before his first term was completed and was hastily replaced by Fred Howser of Long Beach. Buron Fitts returned to private law practice. During World War II he served overseas in the Army Air Corps. He died of what was ruled a self-inflicted gunshot wound in March 1973, age 78. Neither McAfee or Buckwald were called to testify in the Shaw libel case. Buckwald was shot to death at McAfee’s Frontier Club in Las Vegas in August 1942. Bowron ran for a fifth term in 1953 but lost to Norris Poulson. He returned to private law practice and remained active in City affairs until his death in September 1968. Clifford Clinton volunteered for the Army in WWII and active both as Army personnel and as a civilian in assisting the US military in the food service arena, working with Cal-Tech biochemist Dr. Henry Borsook to develop a highly nutritious cheaply produced soy-based food known as Multi-Purpose Food (MPF). MLF was distributed throughout postwar Europe and Asia through a nonprofit agency Clinton founded in 1946 called Meals for Millions. He continued to expand his cafeteria chair and had opened 11 units by the time of his death in November 1969 at age 69.